The sponsor of the so-called “right to work” bill in the House says he is optimistic after it received initial approval Wednesday, despite its opponents declaring victory. The policy would prevent the paying of union dues from being a requisite for employment in private businesses in Missouri. Unions and Democrats say it’s an attack on workers and have declared the measure defeated, because it only got 78 “yes” votes. That’s enough for initial passage, or “perfection,” but more would be needed on a vote to send it to the Senate. Representative Eric Burlison (R-Springfield) says they’re being premature. “I think this is a historic victory,” says Burlison. Four more votes are what supporters would need to reach the constitutional majority necessary for the bill to clear the House and go to the Senate. Burlison thinks they can be found. 19 Republicans voted with Democrats against the legislation, while 11 were absent and two entered neutral “present” votes. The legislation faces a likely filibuster if it reaches the Senate but could result in a move of the “previous question,” a motion to shut down debate and force a vote … a rare move in the Senate. Burlison says that potential means he has time to find four more votes. Even if “right to work” doesn’t make it out of the House, Burlison says its initial passage is a win. Kansas is on the verge of banding with 8 other states including Missouri in forming an interstate health care compact, which would let states go their own way with health care rather than participate in the federal healthcare reform law. The same plan that has passed out of the Kansas legislature, and has become law in 8 states, was first proposed in Missouri. It needed two things to be ratified: passage in at least two states, and Congressional authorization. 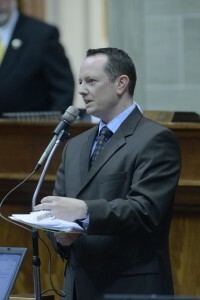 Representative Eric Burlison (R-Springfield) sponsored the first interstate compact proposal, which was enacted in 2011. He says states in the compact would have an option other than the Affordable Care Act. Oklahoma Congressman James Lankford (R) has introduced legislation that would give Congressional approval to the compact. It has been referred to a subcommittee. If it clears the Republican-controlled House it faces a tough road in a Democrat-controlled Senate, which Republicans hope to take control of in elections this year. “It may not be this [Congress] that’s able to do it, but any future legislature could adopt the interstate compact,” says Burlison. Kansas Governor Sam Brownback (R) hasn’t said whether he will sign that state’s compact legislation. The state House has passed legislation to reinstate caps on the amount that could be awarded to plaintiffs for non-economic damages in medical malpractice lawsuits. The bill would limit those damages to $350,000. Proponents say the legislation would keep medical malpractice insurance premiums paid by doctors lower, making it easier for doctors to stay in business in Missouri and keeping down the cost of health care. Opponents say it infringes on the rights of Missourians to have a jury decide what appropriate damages would be. 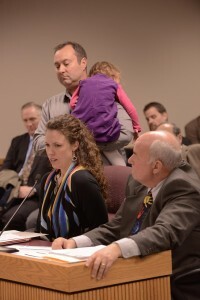 Representative Stanley Cox (R-Sedalia) argued for the legislation, saying it will keep doctors from making the decision to leave Missouri for a state that does limit those damages. Representative Stephen Webber (D-Columbia) says the legislation will put more control over the care of patients in the hands of insurance companies rather than doctors. The legislation, HB 1173 sponsored by Representative Eric Burlison (R-Springfield) was sent to the Senate 94-61. The state House has given initial approval to a bill that would cap the amount that could be awarded to plaintiffs for non-economic damages in medical malpractice lawsuits. The bill sponsored by Representative Eric Burlison (R-Springfield) would limit such damages to $350,000 but would not apply to damages such as lost wages or hospital bills. Supporters say the bill is needed to keep medical malpractice insurance premiums paid by doctors low, thereby making it easier for doctors to stay in business in Missouri and keeping the cost of health care down. Opponents say the bill infringes on the rights of Missourians to have a jury decide what appropriate damages would be. 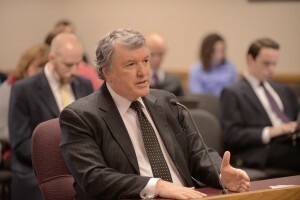 The proposal is a priority of House Speaker Tim Jones (R-Eureka), who says since the state Supreme Court threw out such caps in 2012 Missouri is at risk for rising health care costs, lesser quality of care and a struggle to get health care professionals to come to or stay in the state. Four House Republicans testified against the proposal during debate on Wednesday. Representative John McCaherty (R-High Ridge) says he will be one of those voting against the proposal. The legislation drew criticism from several Democrats as well, including Representative Stephen Webber (Columbia). Burlison says doctors have asked him to continue to support the issue. Another favorable vote would send the legislation to the Senate. Hours after Missouri has carried out its fourth execution in as many months a House committee will hold a hearing on a bill that would have the Department of Corrections bringing its proposed execution protocol to a legislative committee for review. Springfield representative Eric Burlison proposes having the Department’s protocol be reviewed by the Joint Committee on Administrative Rules. Currently the Department is exempt from that committee’s review. The Department’s protocol and changes made to it have been at the center of debate in recent months, particularly by lawyers for the four condemned inmates who have been executed in November, December, January and February. They have said that because it keeps the maker of the drug to be used secret, and because the protocol has been changed several times in the past year, they are at an unfair disadvantage to challenge whether those men will suffer painful deaths that would violate their constitutional rights. That hearing is today at noon in the House Judiciary Committee, and will take place in the basement of the Capitol. The Director of the Department of Corrections has for the first time spoken publicly about the questions and controversy raised in recent months over the carrying out of executions. George Lombardi has told the House Committee on Government Oversight and Accountability it is a statutory requirement that his Department conduct executions, and it is working within the statutory framework in place to do so. He says it is because of that mandate that the Department looked “all over the country” for a way to acquire a drug to use in lethal injections when it became clear it could no longer use propofol. Lombardi did not confirm or dispute the identity of the pharmacy, reported to be located in Oklahoma and only now seeking a license in Missouri. He did confirm that the drugs are paid for in cash, something that he says has been true since the administration of Governor John Ashcroft. Lombardi says all those involved in the execution protocol who must be paid are paid in cash. He says that is because those participants have made clear that they would not be involved if they were paid any other way. He says it was part of maintaining anonymity for those participants. His testimony was challenged by Attorney Joe Luby with the Death Penalty Litigation Center, who says Lombardi is “abusing” the state statute that requires the identities of members of an execution team to be kept secret. That shouldn’t include the pharmacy, says Luby, who says then that the pharmacy’s identity should not be kept secret and it should therefore not be paid in cash. Luby also accuses Corrections of moving too quickly in carrying out executions. A federal judge has also been critical of the timing o the execution of Allen Nicklasson in December. Assistant Missouri Attorney General David Hansen tells the Committee Missouri has acted within the law. 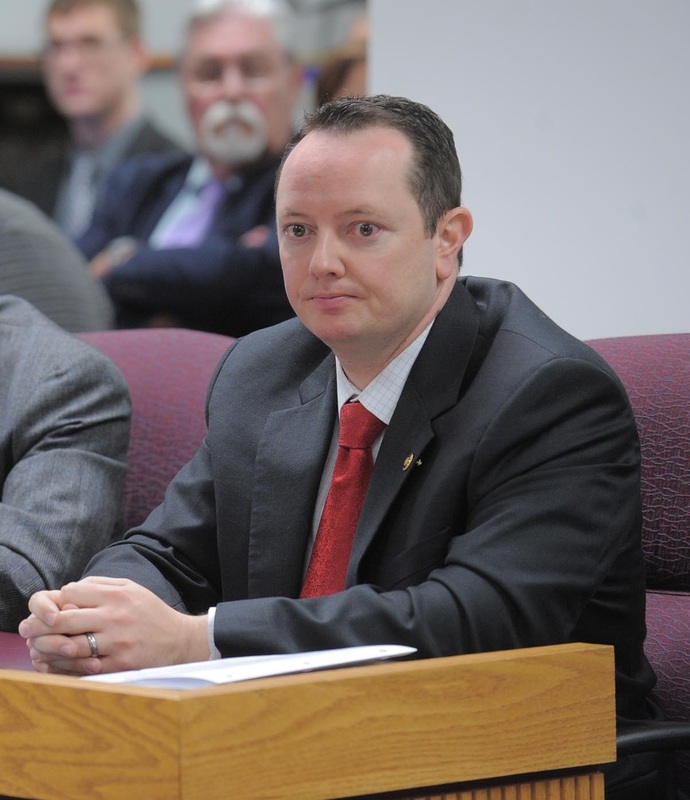 The Chairman of the Committee, Representative Jay Barnes (R-Jefferson City), says he is satisfied that Missouri has not executed while a stay was in place that should have halted it. Barnes refers to legislation offered by Representative John Rizzo (D-Kansas City), that proposes a moratorium while an 11-member panel reviews death penalty and execution protocol. His legislation (HB 1409) has been assigned to the House Judiciary Committee but a hearing has not been scheduled. Rizzo says the legislature needs to have some oversight into the execution process. Barnes noted legislation filed last week by Representative Eric Burlison (R-Springfield), HB 1737, that would make the execution protocol subject to review by the Joint Committee on Administrative Rules as being one avenue for increasing oversight. That bill has not been referred to a committee. Rizzo is one of its co-signers. Missouri is scheduled to carry out another execution on February 26; that of Michael Taylor, who pled guilty in the abduction and murder of 15-year-old Ann Harrison girl in Kansas City 1989. The House Committee on Workforce Development and Public Safety is holding a hearing at this hour on proposed “Right to Work” legislation (HB 1099) sponsored by Representative Eric Burlison (R-Springfield). House Republican Leadership has said “Right to Work” will be a priority again this year, as evidenced by holding a hearing on the first Monday of the legislative session. Supporters say “Right to Work” would bar the payment of union dues from being a requisite of employment, and argue that businesses have taken jobs out of Missouri or chose not to bring them here because Missouri is not a “Right to Work” state. Opponents say it would allow some workers to become “freeloaders” who benefit from union representation without paying for it. Chairman Bill Lant (R-Pineville) says the committee will not put time limits on testimony but will cut people off if their testimony becomes “redundant.” The Committee will take a break at 2:00 if necessary. Watch a live stream of the hearing here.